A decade ago John Boyle shocked Motherwell supporters and everyone involved in Scottish football by announcing that the club was up for sale and that it was going to enter a period of interim administration. 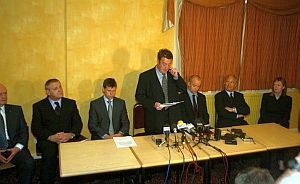 A media conference was held in the Cooper Suite at 1pm and the grim faced chairman announced the news. A new financial reality was about to overtake Scottish football. Manager Eric Black and Pat 'Chiefie' Nevin choose to leave and Terry Butcher stepped up and took charge of team affairs. In December 2003 John Swinburne was quoted in the Scotsman saying, "He[Nevin] was awarding extended contracts to guys who were under-achievers. The result was that Motherwellended up in huge debt and going nowhere. Our annual debt figure was GBP 2-GBP 3m per annum, and rising. John Boyle had no option but to put the club into administration and get things back on an even keel." In the first few days following the shock news, the papers concentrated on the details released by the club but one or two did start to examine the wider implications for the game in Scotland. One of the reports that best sums up that fateful day came from Andy Devlin writing in the Sun. I WAS at Fir Park the day John Boyle was unveiled as Motherwell's saviour way back in August 1998. I don't mind admitting I got sucked in too. But yesterday Boyle was a far cry from the flamboyant character sent up as Frankie Howard on Off The Ball. Instead, we were looking at a chairman a million miles removed from the one who burst into Scottish football four years ago brimming with enthusiasm and confidence. Reduced gates, free admission for kids, bring a friend days, he'd tried every madcap, innovative scheme imaginable in a bid to ignite the fires which slowly burned at his club. But as the debts mounted and the strain took its toll he was forced to douse those fires once and for all. His voiced strained as he tried to thank his staff, the fans and everyone who tried to help build and sustain his dream at Motherwell. It was enough to make grown men swallow the lump in their throats as Boyle's bottom lip trembled and he uttered the words he probably never thought he'd say - I'm off! At the end, with the trauma of telling the world he'd failed over, Boyle looked around, said a 'Thank You' to the press and trotted out of the Davie Cooper Suite a dejected, broken man. You just wonder what the great man Coop would have made of it all. I was there for the calm before the storm as SunSport rolled up to Fir Park at 8.45am yesterday morning. Just a handful of cars were parked in the street just a few hours before the news that would shake Scottish football to it's core. The players had been told not to report for training as normal and instead arrive for crisis talks with chairman Boyle and his board at 11am. Most, if not all, wore the look of troubled men as they began to file into Fir Park from 10.30am onwards. But no one -as several players admitted afterwards -had been prepared for the Boyle bombshell that was to explode in their laps. First, he elected to tell the non-playing staff at Motherwell of his decision to put the club into interim administration and slap a For Sale sign across the front of the Chapman building. And after the most emotional meeting of their lives, the Fir Park staff began to leave one by one as they made way for the players. The sounds of anguish could be heard from just outside the press room as one worker tried desperately to digest her fate. It was hard not to share in her grief. It was then that those who had not yet grasped the full reality of the situation finally opened their eyes to the big picture. With a staff of around 80 -and that's not including the stewards, waiters and chefs drafted in on matchdays -yesterday's events had a massive effect on a community. In an area where employment has been in short supply since the closure of the Ravenscraig Steelworks in 1991 -ironically the year Well last tasted Scottish Cup glory -this was the last thing anyone needed, not least Boyle himself. He tried, and ultimately failed, in his bid to make Motherwell a serious force in Scottish football. Whether you give a hoot or not, you wouldn't have put your worst enemy in the position Boyle found himself in yesterday. Hailed as some sort of messiah and seen as the catalyst for great things at Motherwell, Boyle had helped build up the dreams and ambitions of not just the staff he employed at the proud club but an entire community deprived of good cheer for years. How do you think he felt yesterday when he had to stand in front of the people he'd carried along on a wave of hope for four years and tell them the ride was over? I'll tell you. It cut him to the core in a way he'll never forget. It was an emotionally drained Boyle who finally threw back his shoulders as he walked in to face the press at 1pm. He'd taken the body blows he'd dished out to his playing and non-playing staff just an hour earlier. So would you if you had to tell people who worshipped you their jobs were on the line. Yet here he was, a beaten man preparing to make his last stand. He went through hell delivering the carefully prepared statement which sounded the end of his era at Motherwell FC. Thing is, his mind will wander back there every day for the rest of his life because his dream -the impossible dream -of taking Motherwell to the top ultimately crashed and burned. For the rest of that week the demise of Motherwell dominated the back pages. Pieces from the Times, the Herald, the Scotsman, the Daily Mirror, the Daily Record and the Evening Times can be found here.